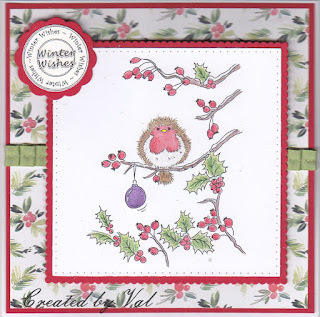 My pile of Christmas cards is growing and now includes this one made with an image from Lili of the Valley featuring this robin amongst the berried branches. Colouring was done with pencils and the backing paper was from my stash. A piece of pleated ribbon and printed sentiment were added and the snow on the branches was glittered although I'm not sure it shows here. 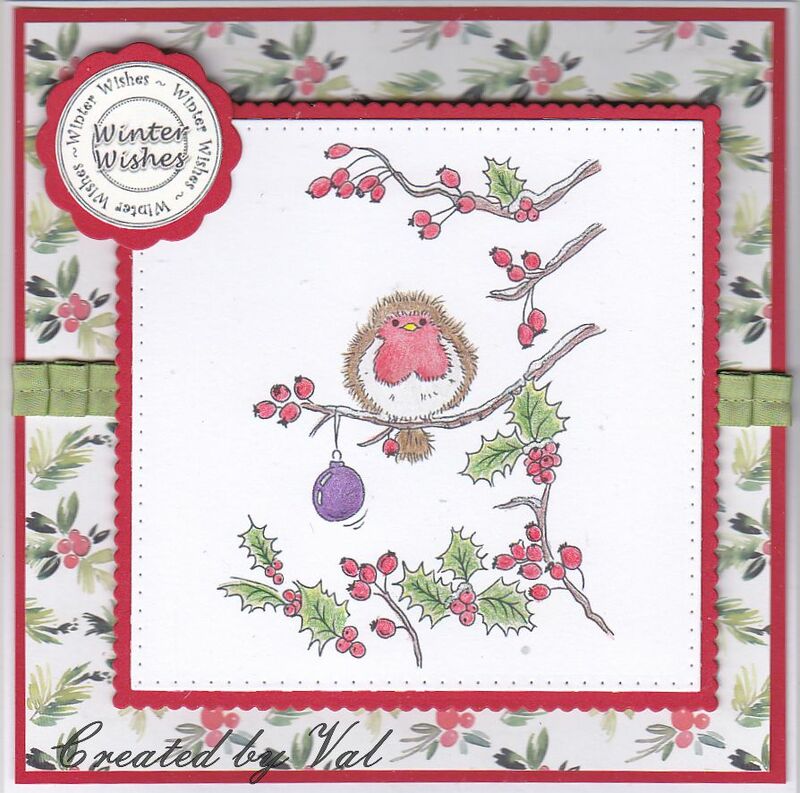 A gorgeous card Val, such a beautiful image too it goes perfectly against the backing papers. love this precious card Val...so sweet!! I just love Robins on Christmas cards. Your design is wonderful and your colouring of that Robin on the branches is super. Pretty paper also match the lovely card. Love this beautiful card, Val. It is soooo cute! Kisses, my friend. I love this fluffy little chap - looks like he has been at the Christmas Pudding! Very pretty card Val. I have some of. Having messed around putting my genealogy onto two computers because I couldn't do a straight transfer I thought going back to basics was a good idea!! Can't beat paper and pencil. Hugs Mrs A.
Super colouring of that beautiful image and your backing papers are the perfect match! Pleased I am not the only one with stash that goes way back and is no longer available! Have a lovely weekend Val. such a beautiful image too it goes perfectly against the backing papers. Your robin image is lovely and I like your pretty card. That Netty's Freebie is a great sentiment.